Although super-thin Ultrabook laptops are all the rage at CES this year, the majority of surveyed adults in one poll predict the tablet will ultimately take the place of the laptop altogether. Poll Position (PDF)surveyed 1155 registered U.S. voters this month and found an astonishing 46 percent of them said they think tablets like the iPad will eventually replace the laptop. 34.8 percent, by comparison, think the laptop will still stick around, and 19.2 percent had no opinion on the matter. Tablets are definitely becoming more powerful and capable, with quad-core processors, keyboard accessories, cloud-based services, and remote desktop apps making them just about as functional to use as laptops. The Asus Transformer Prime tablet is just one example of a tablet that may replace even business users’ need for a laptop. That said, declaring laptops dead (as Fast Company recently did) is still premature. 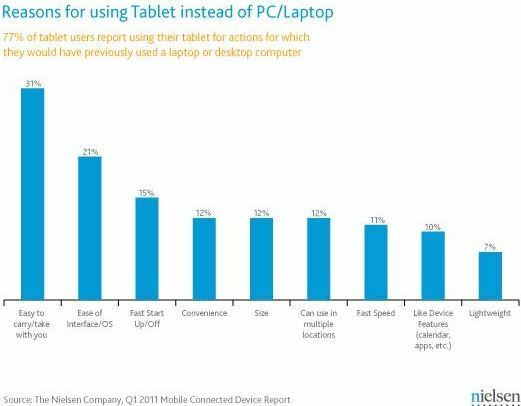 Sure, last May, Nielsen surveys showed tablet owners using their other devices less often. But we’ve been wondering whether a tablet could replace your notebook ever since the iPad started making waves. Laptops are getting thinner, lighter, and flashier -- as well as more affordable -- which doesn’t sound like a recipe for extinction to me.